For a lot of people, family portrait sessions can be really stressful. Are the kids going to have a meltdown? Is Dad going to throw a temper tantrum? What if junior decides to play in the mud in his Sunday best? Does my hair look okay? There’s just so much pressure to get the perfect picture! Well, for starters, let me remind you that the perfect pictures aren’t always the best photographs. And sometimes, its the story behind those imperfect images that make them so beautiful and valuable that you will hold on to them forever. So, don’t stress so much about getting the perfect portraits that you forget to enjoy the moment and miss the opportunity to experience your portrait session with your family. Leave the hard part to your photographer! Choose the clothing for your family portrait session carefully. Be sure to choose the clothing for your family portrait session well in advance and select outfits that are both comfortable and attractive. If you are looking for portraits that are soft and elegant, consider soft flowing fabrics in neutral colors like creams, pastels, tans, grays, or slate blues. If your family has a more fun-loving side, think about coordinating (not matching) outfits with bolder accent colors. If you’re taking portraits in a natural setting, earth tones are a great choice. I usually advise people to avoid wearing white, as the white clothing will quickly become the brightest part of the image and could be very distracting. You can also use accessories like scarves and hats to add to your image. Be careful that the clothing you choose is not so bold that it’s the only thing you see in the portrait—we want your beautiful faces to be the focus of your family pictures. Come to your family portrait session fed and well rested. Be careful not to schedule your portrait session around your children’s nap or bedtime. I often try to schedule outdoor sessions a few hours before sunset or after sunrise because that time of day often yields beautiful warm sunlight. If this is a bad time for your children, be sure to talk to me in advance about other options. We can still create beautiful images of your family at other times of day. Similarly, don’t arrive at your portrait session hungry! It’s pretty tough to smile on an empty stomach! If you’re planning to have dinner after your portrait session, make sure everyone has a filling snack before we get started! Give yourself plenty of getting ready time. Mom’s in particular should take note of this one, as they are usually the ones having to run around and make sure the rest of the family is dressed and ready. If you and your family arrive at your portrait session feeling rushed and disorganized, it will set the tone for the entire session. Believe it or not you will almost certainly see the stress you feel in your portraits. Leave yourself plenty of extra time to prepare beforehand so you can start your session comfortable and relaxed. Ask Dad for his game face. As a Dad myself, I’ll go out on a limb and say that a lot of Dad’s hate photo sessions (and high school senior boys aren’t too far behind!). But Dad’s can really set the tone for the entire portrait session and an example for your children. Be sure to remind Dad how important this is to you and to your family When his children are grown and out of the house, how will they remember their father and this experience when they look at the family portrait hanging on the wall? Dads can give their family a tremendous gift, simply by lightening up and sharing a few smiles on the day of the portrait session. Don’t ask your kids to smile. And DEFINITELY don’t tell them to say “cheese!” Instead, tell them jokes. Ask them to tell you jokes! Get them laughing. Help them have a great time. And be sure to give them some space to interact with me on their own terms. If they are enjoying the session, the smiles will come. And they will be real smiles, not cheesy forced grins. Don’t stress out if you’re kids aren’t smiling the entire time. It’s my job to capture those moments when they happen naturally, it’s not your responsibility to create them on cue. Do your best to forget about the camera and make the most of this experience with your family. Pick up the kids. Give each other hugs and kisses. Poke fun and play with each other. Be the family that you are. The more that you interact with each other and enjoy each others company, the more opportunity I will have to capture your family’s true essence. Consider bringing an item or activity that defines you as a family. Take a minute to think about the objects or activities that bring your family together. Does your family have a favorite food? A favorite sports team? Do you love to read or fly kites? Maybe you play cards or have a favorite board game. Maybe you ride bikes, jump rope, or hula hoop! 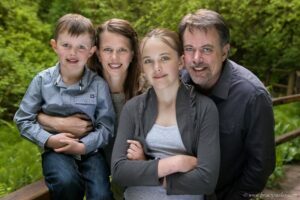 Consider incorporating those unique aspects of your family life into your your portrait session. Not only will it provide a way to keep the youngest members of your family occupied and engaged throughout your portrait session, the photographs will have even more meaning to your entire family than they otherwise would. Do you have questions about how to prepare for a family portrait session? Click here to download my free guide!